Combine flour, sugar, baking powder, butter and egg in bowl with a dough hook, mix until butter has crumbed into flour mix. Add orange zest, oil and Cointreau to milk then pour into flour mix. Mix until the dough comes away from the edge of the bowl. Roll out dough to 4.5mm thick and cut out. 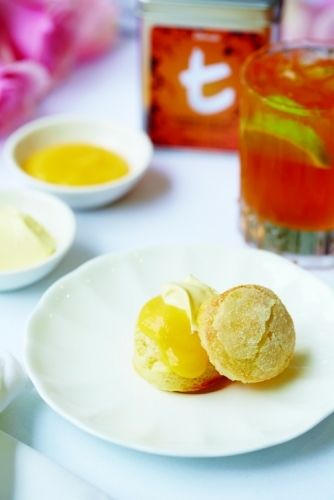 Brush scone with water and dip into sugar. Combine all ingredients in a bowl set over a water bath of simmering water. Strain mixture and refrigerate until cold.